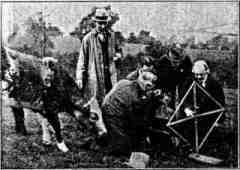 Sheffield & District Wireless Society actually has its roots as a Society as early as 1919 as the images on this page demonstrate, so it can be argued that we are the oldest Amateur Radio Society in Sheffield with current members who carry generations of history with us with a radio heritage over the last 90 years. 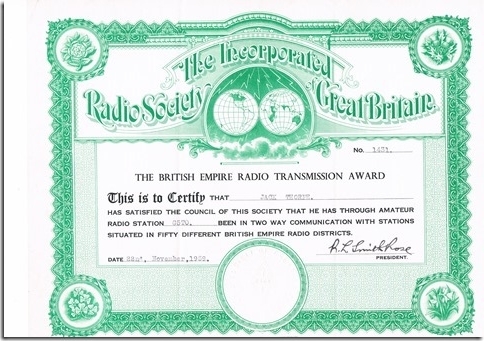 The Society was disbanded around 1930 and Sheffield Amateur Radio Club was formed by Howard G2AS and Harry Beckett G5HK, until that is in October 2013, some nine decades later, which saw many members leave SARC due to frictions to reform S&DWS, bringing across with them a very long wealth of history and knowledge. After an electric and positively charged meeting, Sheffield Wireless was reborn offering a very relaxed, different and refreshing set of membership aims and objectives bringing the old SDWS back to life again! 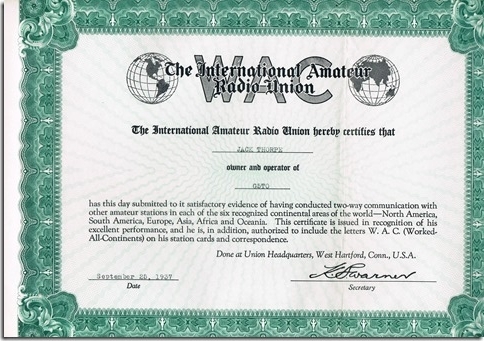 The group of local radio amateurs recognised a need for an informal and relaxed environment in which to enjoy the hobby away from the local politics and past baggage of running a local group. The first informal get together for Krystyna 2E0KSH, Andy M0GAV and Jonathan M0IRQ was originally meant as a sounding out to see what it would be like as a small group of friends to have a relaxed drink at the old 197 Club, now known as the University Arms on Brook Hill, Sheffield. Word had quickly got around about a casual get together that when the evening arrived on the 23rd September 2013, 15 local amateur radio enthusiasts had also dropped in for a pint and a natter, WOW..!! This turned out to be a wonderful evening for all those who unexpectedly came by. After the delight of seeing old and familiar faces, everyone aired their thoughts and wants with no pressure and absolute respect for different opinions. The evening ended with a chorus of applause from all who attended. You couldn’t ask for better. The aims of the society are to foster mutual respect and friendships, as well as promote the enjoyment of amateur radio in and around the Sheffield area. Membership of the society is entirely voluntary, but if requested, would be FREE for life. Life Membership can be requested from the Society who will keep the current membership register. The society will aim to minimise conflicting with the interests of other local groups, for the full benefit of its membership who wish to enjoy other commitments and interests. Activities will be based on *self organisation* to enable members to develop and share their own interests. Any costs from activities for things such as contesting events, affiliations, activities will be covered by those participants and members who mutually agree to contribute financially. There will be no pressure to contribute. All members have a right to be treated with respect and with dignity, no politics and no baggage. Members failing to honor this simple code of conduct will be asked to change their ways or leave. By the time society members met on the first Wednesday in October, the 2nd, interest in the network spiked to around 25 members, but some were unable to attend. To summarise the evening, it was a refreshing change to be in the company of such friendly Sheffield radio amateurs as were there that night. We expect numbers to grow as people come to enjoy the atmosphere we have to offer. The irony behind all this was that the original Wireless Society was disbanded due to disagreements. 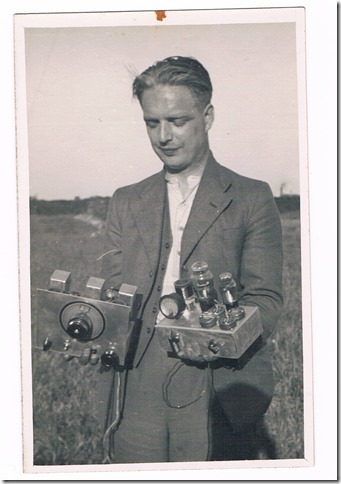 Howard V Booth, G2AS was instrumental in the formation of the Sheffield Amateur Radio Club back in the early 1930s, and was a close friend to Peter G3PHO before he passed away. Decades later, several major disagreements ensued with many of the club’s key members and contesters feeling under pressure to leave a club they so very much loved, resulting in the reformation of the Wireless Society. Consequently, in its first, year, Sheffield & DWS ranked very highly in the RSGB 80m CC proving there existed a strong contest team base, this is despite a struggle to develop a strong contest team in the previous 5 years at SARC. Interestingly, efforts shown in the Wireless Society’s 2014 entries strongly proved the there had existed a strong contest team having held the 4th position in 2013, with a double barrelled irony that previous non contesters at SARC now formed a strong and formidable team in the UKAC’s during 2014. Now, if only both sets of groups and contesters had been able to do this before, forming a strong a large team which could have proved to be the UK’s top contest team, thus putting Sheffielder’s right on the map. This demonstrates there was no disappointment to be had but it was shame how things turned out. After much friction, those contesting members decided to move on, away from the disagreements which continued for months on, primarily to enjoy what is a hobby first and foremost, enjoying a Society which now provides a very positive and stress free experience. It is for these reasons which formed the basis of the Society’s Aims and Objectives shown above, the values of which members proudly hold dearly onto with the main themes being friendships, mutual respect and no baggage or politics. 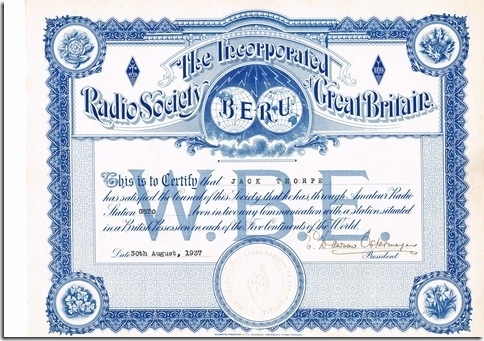 As a result, whilst the Wireless Society hasn’t been in existence for roughly 9 decades until it was reborn in October 2013, its name has lived on and boasting a large membership. We suspect Howard G2AS will be turning in his grave, but non-the-less proud of the principles and strongly held values of the reformed Society members. This was formerly the callsign of Jack Thorpe who passed away in 1961. His son, Roger Thorpe, was kind enough to give the Sheffield & DWS this call sign in honor of his dad, Jack. Jack was originally given the call 5TO somewhere in the very early 1930’s as prior to that date 5TO was allocated to an H Rayner in Cleckheaton. 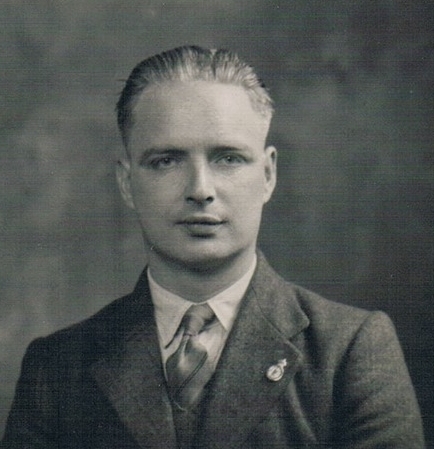 Jack G5T0 was active for the whole of the second world war as a Civilian Radio Interceptor with the Radio Security Service, and he is included on the Bletchley Park Veteran’s Roll of Honour. A certificate of Recognition signed by Sir Herbert Creedy and a covering letter was presented to Jack for his work. 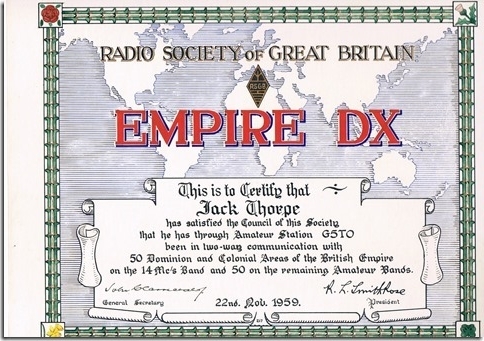 He was the holder of many certificates of stations contacted including a hand-crafted certificate called the ‘Empire DX’ dated 22 Nov 1959 which his son Roger how has possession of. Roger as a lad witnessed his dad Jack spending hundreds of hours in front of a radio receiver, both wearing headphones,listening to ‘Sputnic’ as it went over in the 50’s. Roger still has all the ‘contact cards’ that came through the post were destroyed after his death in 1961 and the equipment that made up his ‘station’ was sold or given to fellow enthusiasts. We as a Society are very honoured to be using G5TO’s callsign in memory of Jack Thorpe, with the kind permission of his son, Roger. It’s a great callsign, and rolls nicely off a morse key! After a gap of 52 years, G5TO was heard once again for the very first time in a 2 metre QSO with Graham G3YJR on the evening of 20th November 2013. We look forward to using this callsign regularly as the Society embarks on an exciting journey, undertaking contests and events to promote Amateur Radio in the Sheffield and surrounding areas.